I love the concept of the 'christmas eve box' I know that some families go all out and fill it with loads of goodies but we like to keep ours nice and simple. This is our second year and has become a tradition in our house now! In fact we don't open ours on christmas eve at all, we open ours on the saturday before christmas because we always have The Teens the weekend before christmas. I thought I'd show you ours from last week and then next week sometime I'll show you this years! I covered a copier paper box from work with wrapping paper and just popped a sticker for them on the front. T knows that this is not from Father Christmas, this is just from Mummy & Daddy. As you can see, little hands getting in there straight away!!! I only wrapped the nightwear, the rest was just in the box. I plan to do the same this year too. After the children opened their box, H read the book to T and they put on their onesies and PJ's and we all sat down with the snacks to watch the film. It was a lovely evening, nothing over the top nothing too expensive just something a little different and a new household tradition. What do you put in your Christmas Eve box? Is yours extravagent or quite modest like ours? 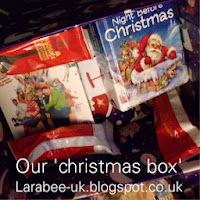 My blogging buddy Becky over at 3princessesand1dude.blogspot.co.uk has 5 great ideas for your Christmas Eve Box which you can read here.